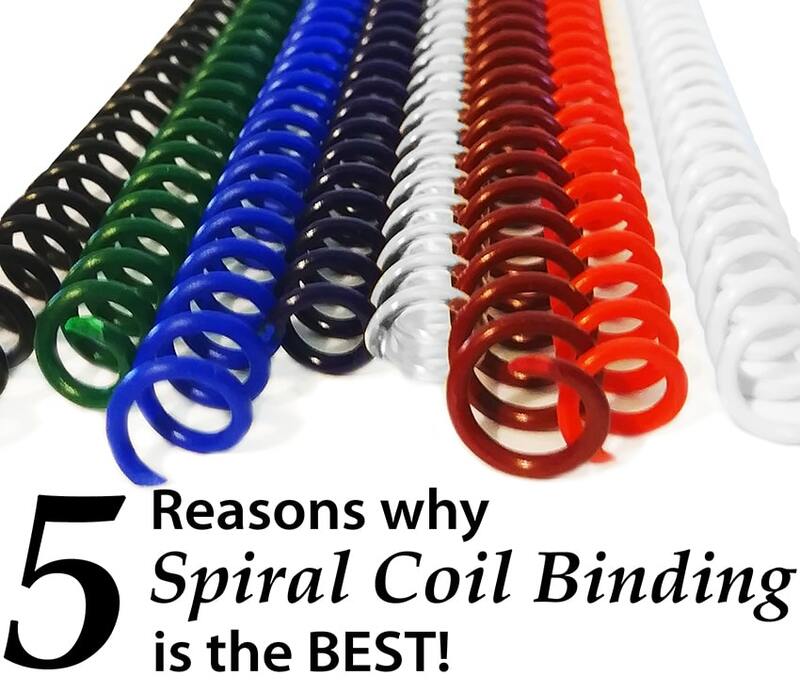 5 Reasons why Spiral Coil Binding is the Best! 1. "They are durable!" Coil bindings are made of a flexible plastic that makes them incredibly durable. They actually bounce back when bent and twisted around, so they can be handled a lot and not get damaged. This makes them incredibly long-lasting. 2. "They come in a ton of colors!" You can choose from 8 stocked colors (more than other binding methods), as well as more than 15 special order colors that can usually be made in just a few days. 3. "They are easy!" Coils are simple to bind with, and you don't have to close them (modify the binding itself), so the finished look is always round and is always consistent. 4. "They are affordable!" Binding coils are the middle-range in price for consumables, with wire generally costing more, and combs costing less. They cost as little as about $0.05 each. 5. "They are fun!" I was excited to hear that I was not crazy for thinking that coil binding is more fun than the other options. So what do you think? Do you agree with these customers, or do you have a different favorite way to bind? Let me know! Email me at mallorym@binding101.com for a chance for your company to be featured.